They say history often repeats itself. 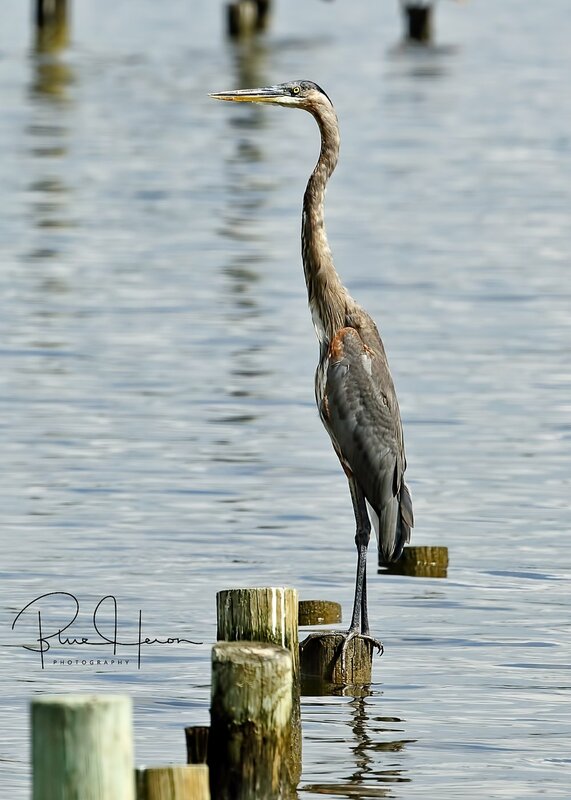 I have been observing the local Broward River marsh birds closely for almost five years now. A review of prior blogs helps me determine which birds will be around to photograph. Recently I have been expecting to capture “the flash”. I was not disappointed. The quiet morning began with a cup of coffee on the dock. The sun was still low and casting shafts of light over the tidal stream below my feet. A loud squawk announced the arrival of the local Tricolored Heron on the dock. The outgoing tide channels pools of minnows and the heron had arrived to begin its morning hunt for the hapless fish. My presence seldom deters a bird on the hunt and this morning was no exception. The heron just ignored me and danced in and out of the morning dock shadows only a few feet from my position. Sometimes it was too close to photograph, as this large lens requires a minimum distance of about 10 feet to focus. I was lying low on the dock trying to capture some birds-eye level photos of the feeding heron when out of the corner of my eye I saw a flash of pink light reflected on the water. I froze for a second while shifting my gaze around not wanting to spook the new arrival. To my left and very close was a beautiful pink Roseate Spoonbill that had flown in to feed in the outgoing tidal bounty. Changing exposure settings on this lens takes some skill when you are lying on your back holding a camera upside down at near water level. However, I managed to capture a few good frames before “the spoonie” wandered up the river and out of prime photo range. What expectations have you had lately? If you listen to the news, the outlook may seem grim for this country. I surely hope history does not repeat itself and find us in another civil war based on hate. Only a flash of light coming from the east will save us then. And we won’t be disappointed to see it either. Blessings. 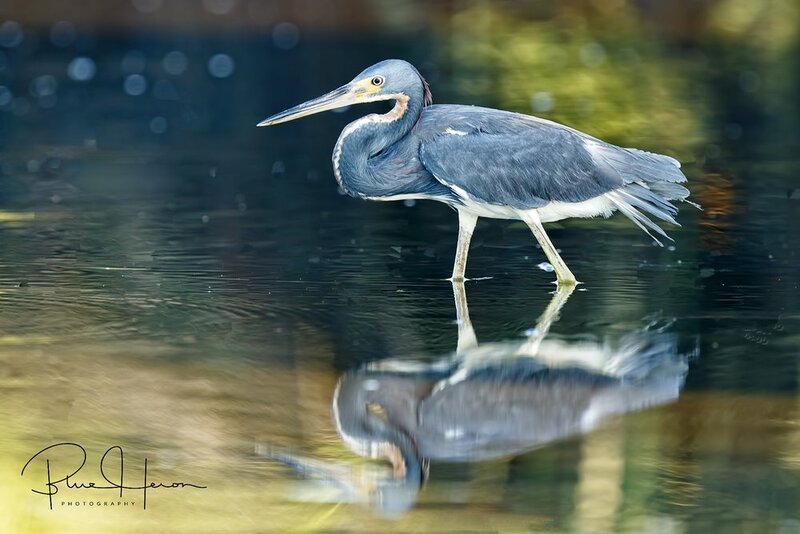 The Tricolored Heron danced in and out of the shadows on its morning hunt.. While taking this photo I saw a "flash" of pink light reflection to my left.. 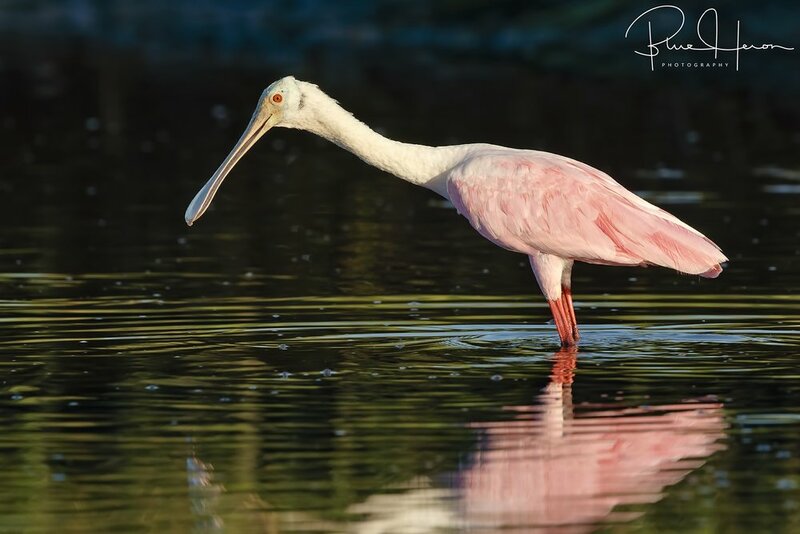 The pink flash was this beautiful Roseate Spoonbill that had just landed to begin feeding.. Some might call it “wastin time” but the Editor and I found our getaway this week with some old friends to be time well spent. We met them at their daughter’s “Happy Place” in Orange Beach, Alabama and had a nice relaxing week. Not far from their historic 1925 era cottage was an art center where we saw artisans blowing glass figures and making pottery. A local Great Blue Heron by the name of “Jimmy” was supposed to hang around there in the peaceful pines along the bay. Sure enough, no sooner had I sat down on the bench when I heard a loud squawk as Jimmy lifted off from the tree next to me and flew over to a restaurant pier. It appears Jimmy does not like getting his picture taken. The challenge was on. We drove to the restaurant pier and sure enough there was Jimmy. And just like before Jimmy was bound determined not to let me get close enough to photograph. I did manage to catch him posing like a piling before flying off back to the art center. A very unhappy Osprey also let it be known it did not want any photos taken either. What is a bird photographer supposed to do? Thankfully the pelicans and terns were happy to pose for photos while “sittin on the dock of the bay”. Take time to see old friends while you can. Unfortunately, we couldn’t stay longer and look up some other folks in the area but next time we will. 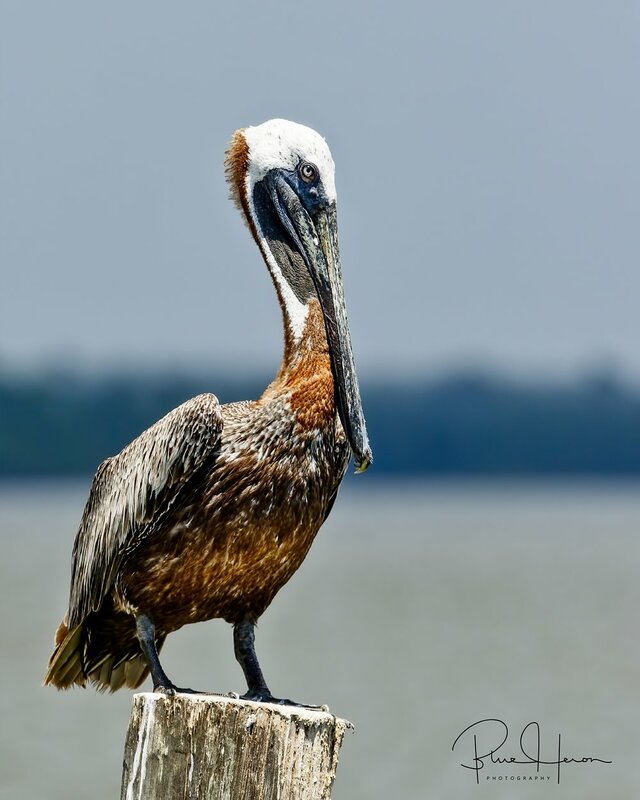 I plan to give ole Jimmy another run for his money when the pelicans are in their breeding plumage. Thank you Michelle and Charlie for sharing your “Happy Place” by the dock of the bay. 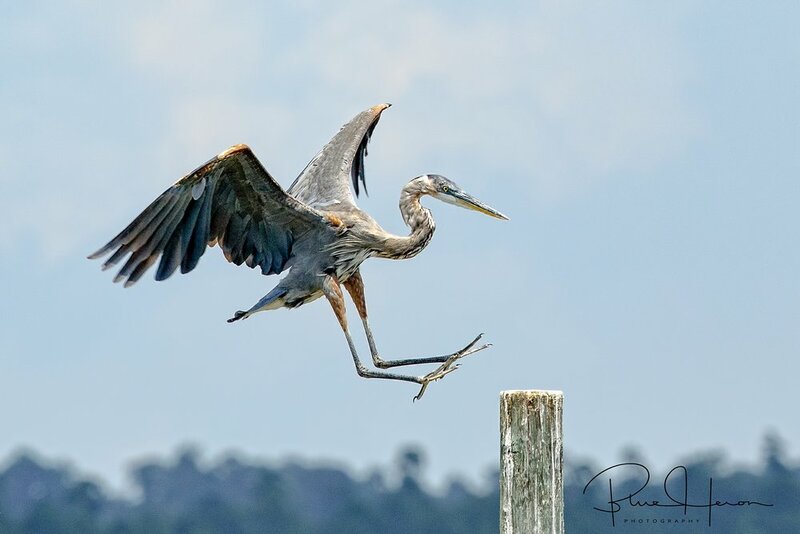 "No photos allowed Mr Doohickey" squawked Jimmy the Great Blue Heron.. If I pretend to be a piling maybe Mr Doohickey won't photograph me..
Forsters Tern posing for a photo.. The Brown Pelicans had no problem getting photographed while watching the tide roll away.. It is truly the dog days of summer in Florida. My three wiener dogs have dog days every day. They get up, pee, eat and pooh (mostly in the house lately because of the rain) and then do nothing but sleep, more sleep, and then eat and pee again. Per the Farmer’s Almanac, the dog days or dog days of summer are the hot, sultry days of summer. They were historically the period following the helical rising of the star Sirius, which Greek and Roman astrology connected with heat, drought, sudden thunderstorms, lethargy, fever, mad dogs, and bad luck. They are now taken to be the hottest, most uncomfortable part of summer in the Northern Hemisphere. The Editor bought some “bee and wasp free” hummingbird feeders and her friend Rosemary set them up. I was skeptical about the bee and wasp free thing. Last year we took them down because of all the wasps they attracted. So far so good. We are getting some great views from the kitchen table of Ruby, the Ruby-throated Hummingbird. Per the Cornell Laboratory of Ornithology “A flash of green and red, the Ruby-throated Hummingbird is eastern North America’s sole breeding hummingbird. Enjoy them while they’re around; by early fall they’re bound for Central America, with many crossing the Gulf of Mexico in a single flight. Ruby-throated Hummingbirds are bright emerald or golden-green on the back and crown, with gray-white underparts. Males have a brilliant iridescent red throat that looks dark when it’s not in good light.” We have several pair in the area right now and I am trying my best to capture some photographs of them. The favorite perch of this particular hummingbird broke the next day after the photo making more attempts difficult. In the meantime some of the regulars like "George" and the Great Egret are still in the area. I don't have hands so I have to wave with my feet Mr Doohickey! And to the left...where is that kid of mine? Some of you may remember the late David Carradine’s 1970s Kung Fu series. It made the martial arts very popular in America. I recently saw another form of Kung Fu fighting on the beach. Only this new form was called "Crab Fu"! A small Ghost Crab who went by the name "Crabhopper" scampered across the sand and crossed in front of a fledgling Royal Tern. The young bird, though inexperienced in finding its own food, decided this might be a nice lunch instead of the usual fish it had been gorging on for the past month. Crabhopper, however, was not so enamored with this idea and immediately went into its best “Crab Fu” stance and let the bird know it had better back off or else. The daunting size of the bird was no match for Crab Fu fighting. The look on the young Tern was one of shock and awe. At this point the little crab decided to use all its legs and boogey out of there as fast as possible. Ghost Crabs can disappear in a matter of seconds right in front of your eyes. And so it did. Unlike the proverbial David and Goliath story, this “giant” lived to eat another day. And so did little Crabhopper who continues to warily wander the beach in peace while in search of tidbits hoping not to become one. But when danger arises, so does the "Crab Fu" fighter with claws as fast as lightning. Blessings. The dog days of August begin...this Great Egret stands as a Summer Sentinel..
Royal Reflections..a Royal Tern chick has fully fledged and enjoys a morning dip in the tidal pool. Sandwich Terns attempted to nest this season also...But the Royal Tern had another "Sandwich" in mind. Crabhopper crossed the path of a Fledgling Royal Tern looking to make lunch out of the wary crab. Trained in Crab Fu, Crabhopper immediately went into his fighting stance kicking sand in the Terns mouth instead..
Back off bird before I make drumsticks out of you with these claws of lightning..
My master always said to be at peace when possible. But when danger arises, it's Crab Fu time!